Do you love vintage linens? Does your heart go pitter-patter at the sight of an old pillowcase with a beautiful crocheted edging? If you love vintage linens, please check out my review blog, Little Red House Reviews, for a chance to win a gift certificate from newest sponsor, FunkyBabyMine. If you are interested in becoming a sponsor with Little Red House, feel free to email me at mrcarroll@optonline.net. I am currently accepting 125 x 125 button ads at the rate of $25. per month, which will appear in my sidebar under the heading Sponsors. There is a 20% discount for a three-month block. Don't have a button ad? For a one-time fee of $15., I will personally design and create a button ad just for you. This could be a wonderful way to advertise your online shop, or attract more viewers to your blog. I hope to see you all soon at Mosaic Monday. Mr. Linky will be up by 8:30pm Eastern time, USA, Sunday night. Have a wonderful weekend, dear bloggers! We have an antiques show in Weston every fall. It's a lot like this, it seems. I love the way they display their wares. The all silver booths are glorious. There's one that is just out on the balcony, next to the roaring waterfall. They always have garden furniture and have unbelievable bouquets in large garden urns. I got to hold china from the 1700s! Now, sniff, why didn't I take my camera in???????? Argh! However, the time was really focused on history lessons on china - English and Quimperware and it was a wonderful time with my mom. Oh, and one last memory to share. One of the dealers, that were downstairs, had a wooden oblong bowl full of apples that were just slightly "rotting". It FILLED the place with the most heavenly, appley smell. 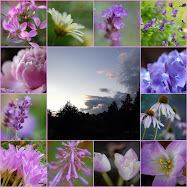 Well, I just want to say that your doughnuts and cider post and the following post with flowers and china made my heart go thumpity thump! =] I've fiddled with obedient plant flowers and they do stay in whatever direction you twizzle them. I, too, felt absolutely done with landscapes after fall (well, just one more.... =]) I love how everyone's blog is getting cozier and cozier. Well, my home is getting more put together, even though I haven't blog for an age and a day. Wishing you well. Katy, I LOVE Weston! We saw a production of Guys & Dolls there years ago. It's such a picturesque little town! Oh my.. Looking at your pics.. I'm falling in love with Vintage linen as well..
No arguements from me - give me a piece of Vintage linen or fabric and I am happy as a pig in mud! I've been hooked since the early 70's when a box lot at an auction in Chester County was found to contain dozens of embroidered napkins - for fifty cents! Your linens are absolutely beautiful, Mary! I'm afraid I don't own anything so fine. Yes, I do love vintage linens, Mary. And the plates that go on top of them too!! I have a bunch of lace/embroidered handkerchiefs that my grandmother collected. Love them. I do love vintage linens! They make wonderful treasures! Oh, my heart definitely goes pitter-pat at the sight of vintage linens! 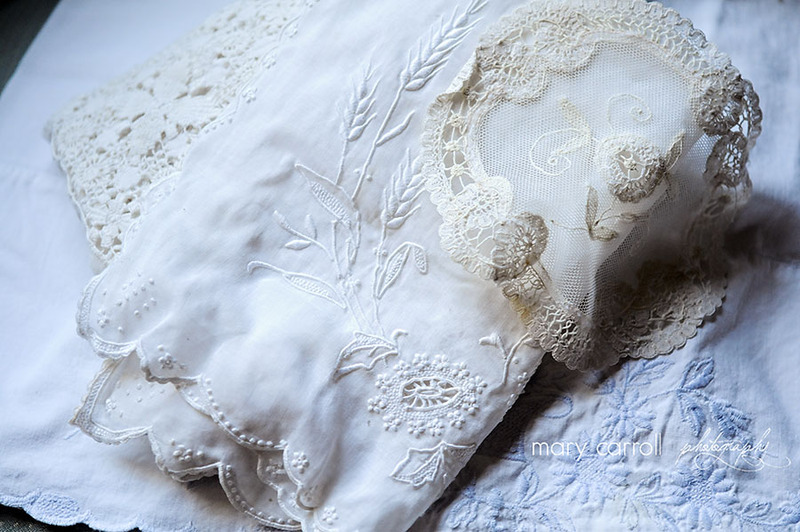 Thanks Mary for showcasing my lovely vintage linens and other treasures. I want to remind your readers that the giveaway I am running is still open and the more the merrier!